In just a few more days, my beloved in-laws are beginning their next journey -- retirement -- in Florida. I know most people would celebrate their in-laws moving, but I actually like mine. I'm thrilled for them, but also sad. They're amazing people and wonderful role models for me, my husband, and our daughter, and dang it, I'm used to having them so close. Who are we going to play Cards Against Humanity with now? And okay, yes, I may also be a little jealous that they're going to be leaving the tundra of Minnesota for the beach. With the big move coming soon, I wanted to make them some celebratory cupcakes and make them smile. I hope these beach-themed cupcakes do just that. 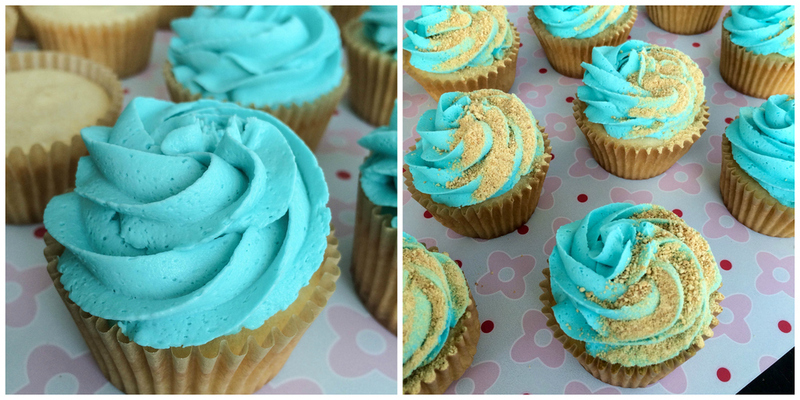 These were easy cupcakes to make -- just vanilla cake with vanilla buttercream tinted with Sky Blue AmeriColor gel. The tricker part was getting the frosting swirls to resemble ocean waves and graham cracker crumbs to mimic a sandy beach. Strawberry fruit strips, miniature Teddy Grahams, and umbrella picks complete the "Hey, look at me, just laying on this beach without a care in the world" feeling. And no baking experience is complete without my daughter further honing her skills. Here she is, practicing those frosting swirls while wearing a cape, beret, and an adorable facial expression.